Group workshops for kids require a minimum of 10 children. Contact us to discuss smaller parties. All projects offered are $30 per child and includes all the supplies needed. 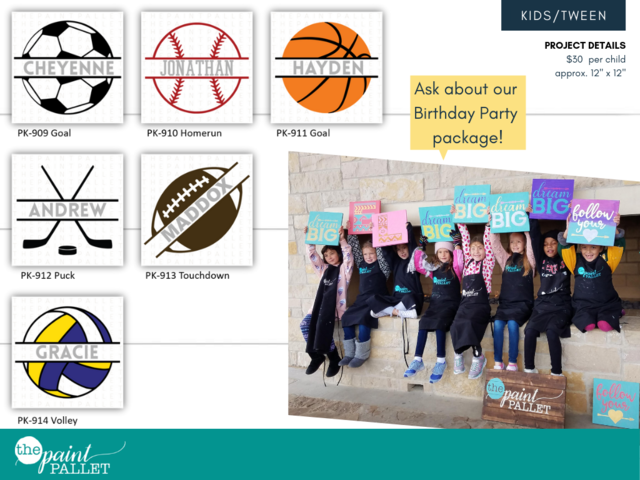 Click here to learn more about Kid's	Birthday parties. Our pint-sized workshops are designed for children ages 5 - 14. 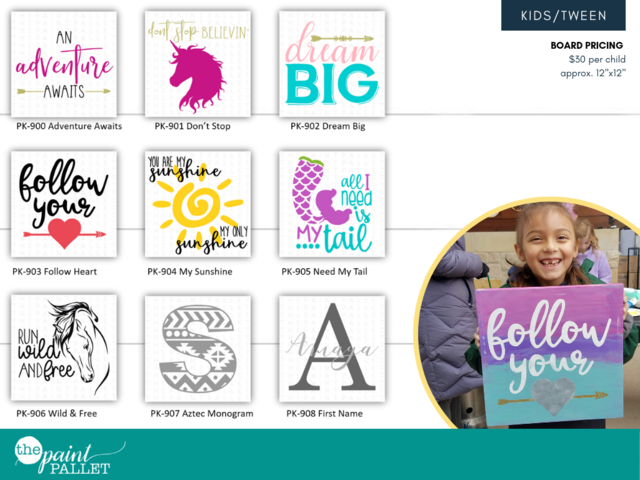 A variety of designs is available to choose from. Have a design in mind? The Paint Pallet is happy to customize a special project for your event. Browse available dates for workshops and secure with a $100 deposit which will be used towards the party total. Party must be paid in full 5 days in advance of event. Click here to book a birthday party! Children's workshops range from approximately 60 to 90 minutes depending on the project chosen. The 18"x8" project is a single wood plank. This project has a variety of design options to perfectly adorn any bedroom or game room! Your child can create their own personal wood photo 'frame'. Each Memory Clip project includes a bulldog clip to easily attached a memory and change it out as often as they'd like. These designs offer some beautifully positive vibes! Your child can get as creative as they'd like with this project. Loads of color is always fun! Got an athlete? They will love these sports themed signs that can be personalized with their name.